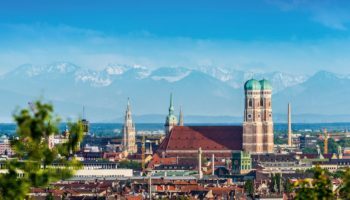 Munich, the capital of Bavaria, was founded by a group of Benedictine monks who settled in the rich farming area that was close to Catholic Italy. In 1175 Munich formally became a city. It was eventually destroyed by allied bombing during World War II. After the war, the Bayern set to work and rebuilt this remarkable place. There are many interesting things to see in the city itself including the famous Glockenspiel. 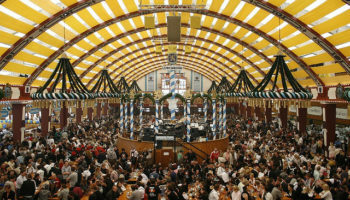 The metropolis also hosts the famous Oktoberfest celebration each year. Hemmingway said of Munich, “You needn’t bother going anywhere else. I can tell you: you can’t beat Munich, everything else in Germany is a waste of time.” Apparently, he overlooked the day trips from Munich to some of Bavaria’s most famous historical sites. The second largest city in Bavaria is rich with medieval architecture. With its ancient Kaiserburg Castle and old churches in the Altstadt, the city’s history goes back a long way; it was considered the unofficial capital of the Holy Roman Empire. Nuremberg was also the location of Nazi rallies; the starting point of the boycott of Jewish businesses and the trials at which Nazis were held accountable after WW2. Following its almost complete destruction by allied forces, the city was painstakingly rebuilt. Nowadays, Nuremberg is a fun and energetic town to visit – especially over the Christmas period due to its magically festive Christmas Market. Not only the place for seasonal celebrations, Nuremberg’s historical streets are packed full of charming cafes and old pubs, where locals and visitors rub shoulders over a local beer. To get to Nuremberg from Munich couldn’t be easier as you simply need to hop on an hour-long direct train that will take you from the heart of one city to the center of the other. Trains run very frequent, so if you miss one, you’ll only ever have to wait a short time until the next one while tickets can cost as little as 7 euros. Once you arrive at the central train station in Nuremberg you’ll find yourself within walking distance of most of its main attractions. While getting there by public transport is very simple and quick, another great option to see as much of the city as possible is by taking a guided tour as this will teach you all about Nuremberg’s history while taking you around all of its main sights. Famed for its links to the Nazis, your guide will look into this side of Nuremberg’s past while also taking you around its beautiful medieval old town and later on to the Nazi Party Rally Grounds. See trip reviews & prices. Tucked away down in Southern Bavaria, Garmisch-Partenkirchen is nestled in the arms of the Bavarian Alps. Naturally, it’s the perfect spot for a little bit of skiing. It’s also home to Germany’s highest peak, Zugspitse, which towers above everything at 2,962 meters above sea level. Summertime pursuits include swimming in the Eibsee and hiking in the hills. Split into two parts, Garmisch is the relatively more modern side of town, whilst wandering around the eastern portion of Partenkirchen is the perfect opportunity to soak up traditional Bavarian architecture. Here you can see wood carvings and Lüftlmalereien, traditional Bavarian fresco paintings. As a direct train runs from Munich Central Station it usually takes around an hour and fifteen minutes to get to Garmisch-Partenkirchen, so in no time at all, you’ll find yourself immersed in nature. Driving is equally quick and offers you the advantage of stopping off at any of the astounding viewpoints you see to take a photo or explore the mountain roads at your leisure. To get to Garmisch-Partenkirchen from Munich, take the Bundesautobahn 95 heading south. Follow it until it merges into Bundesautobahn 2, just before you reach the town itself nestled away amidst the Bavarian Alps. 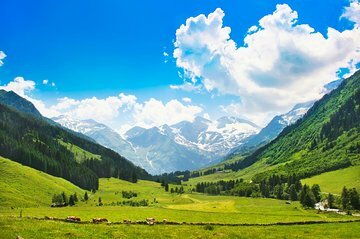 For an easy and stress-free visit to one of Germany’s most incredible landscapes, you may want to consider taking a tour. 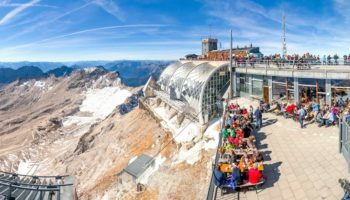 This not only includes a cable car ride up Zugspitze – the highest mountain in the country – but also transport to and from the site. See trip reviews & prices. You’ll find the Bavarian city of Regensburg nestled at the confluence of three rivers: the Danube, Naab, and Regen all meet here. That riverside location makes for a perfect slice of picturesque beauty, especially with the Gothic spires of the wonderfully ornate 13th century Regensburg Cathedral peeking out above everything else. The medieval part of Regensburg is definitely a major draw, but there are also Roman ruins here. The city sustained little damage from the bombings at the end of World War II, and offers visitors the unique opportunity to study the unbroken past of this town. As trains directly from Munich to Regensburg only take an hour and a half, the beautiful Bavarian city makes for a fantastic day out. It couldn’t be easier to get there by public transport; just sit on the train and watch the world go by. It is a similar travel time by car; from Munich, all you need to do is head north on the Bundesautobahn 9 until it turns into the Bundesautobahn 93, then continue until you see signs for Regensburg. If you go by car, there are a number of sights to check out in the surrounding area. The impressive Walhalla monument is well worth stopping by, as is the Liberation Hall at Kelheim – both of which were commissioned by Ludwig I. With so much history on offer in Regensburg, a guided tour is one of the best ways to see as much of the city as possible. While wandering around the medieval city, you’ll see fantastic sights such as the Old Stone Bridge, the impressive Regensburg Cathedral, and the Historic Sausage Kitchen, while learning about the area’s rich history and cultural heritage. See trip reviews & prices. Located in southern Bavaria and set on the Herreninsel, the biggest of the islands on the large Chiemsee Lake – Herrenchiemsee – is a sprawling network of royal buildings. A day spent at the palace complex is one packed full of interesting architectural and historical delights. The palace was built by King Ludwig II in the 19th century, to reflect the glory of Louis XIV, the Sun King of France. On a backdrop of lakes and mountains, the interior of the palace oozes opulence, as it drips with gold and glistening glass decorations – there’s even a grand Hall of Mirrors akin to that at Versaille. Herrenchiemsee lies just an hour and a half away from Munich by public transport. Visitors must first take an hour-long train to Prien am Chiemsee, then embark on a fifteen-minute scenic boat trip to Herrenchiemsee. Driving there yourself takes around the same amount of time. You will follow the A8 south out of Munich until you reach Bernau. Here, turn off at Exit 106 and follow the signs to Prien am Chiemsee, where you need to park the car and take the boat to the island. Hiring your own vehicle gives you the advantage of exploring the area at your leisure, or even hopping across the border to Austria if you feel like it. If you’re looking to gain a deeper insight and understanding into the history surrounding Herrenchiemsee, you may want to consider taking a guided tour around the palace. 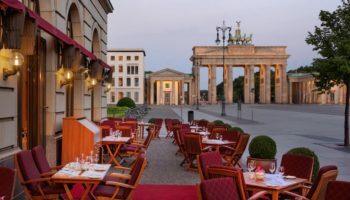 Tours often combine a visit to the island with a stop at the Benedictine monastery on nearby Fraueninsel Island, and a scenic boat trip on the lake. See trip reviews & prices. Set in the Bavarian Alps, Berchtesgaden is a town plentiful in beautiful, mountainous scenery; there’s absolutely no shortage of that. In fact, just to the south of this town is a unique place where you can admire the view: the Eagle’s Nest, which was Adolf Hitler’s alpine retreat. Martin Bormann had it built, and gave it to Hitler for his 50th birthday. In spite of that, Hitler did not spend a great deal of time there. It’s now a restaurant and museum. Nearby, there’s the Salzbergwerk Berchtesgaden, where you can learn all about the 500-year-old salt mine. 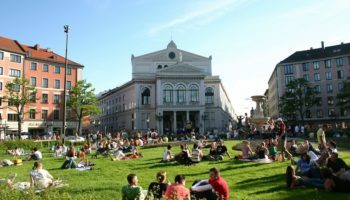 Lying next to the border with Austria, Berchtesgaden makes for a popular day trip, and there are a number of ways for you to get there. Public transport in Germany always works smoothly, so taking the train there is comfortable and convenient, although it does usually take two or three hours. This is because you must first catch a train to Salzburg before changing for Berchtesgaden. Driving knocks an hour off the journey time. From Munich, follow Bundesautobahn 8 south out of the city. You’ll eventually cross over into Austria where it turns into the A10 before looping back into Germany. It’s a very simple drive as the only turn you need to take to find yourself at Berchtesgaden is at Grodig. By going by car, you also afford yourself the opportunity of stopping off at nearby Salzburg on the way back home. 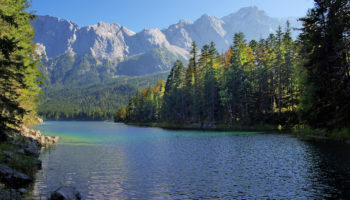 Yet another option is to take a tour to Berchtesgaden; this is a popular option amongst many visitors to Munich as it combines a visit to the famous Eagle’s Nest with a trip to the stunning scenery of the Bavarian Alps. See trip reviews & prices. This medieval town is one of the stops on the Romantic Road, which is a trail that features a number of interesting places to visit. It is approximately at the half-way point between Frankfurt and Munich. Rothenburg is a walled town that has remained intact down through the years. It is famous for being the most German town in Germany. During World War II the Nazi leaders habitually took people on day trips to show them this model village. It is also famous for the stores that carry Christmas items all year round and for having an outstanding Christmas market each December. While it does take quite a bit of time to get to Rothenburg ob der Tauber, the medieval town is adorable and well worth the effort. From Munich, it generally takes around three hours and fifteen minutes by train; this involves a couple of transfers. One option is to take the train to Nurnberg before hopping onto another train to Ansbach, where you then take the 732 bus for the last fifty minutes of the journey to Rothenburg ob der Tauber. Another option is to take the train to Treuchtlingen before heading on to Ansbach and again taking the 732 bus. Driving to Rothenburg ob der Tauber knocks quite a bit of time off the journey, which only takes two and a half hours. In addition to this, you get to drive along the ‘Romantic Road,’ which is home to some wonderfully picturesque medieval towns and Nordlingen and Harburg are particularly worthwhile visiting. By car, take Bundesautobahn 8 heading northwest from Munich before turning off at Gersthofen and continuing along Road B2. After following this road for a while, you’ll eventually end up on the Bundesautobahn 7 which will take you all the way to Rothenburg ob der Tauber. 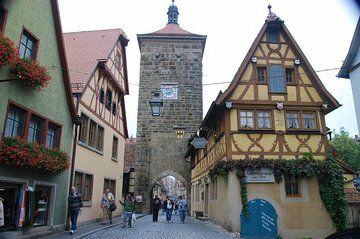 To make the most of their trip along the Romantic Road, many people take a tour which combines a visit to Rothenburg ob der Tauber with a stop at Harburg Castle. See trip reviews & prices. Less than twenty kilometers from Munich, Dachau is a short day trip from the Bavarian capital. Dating back to the 9th century AD, the city has a long history but is best known for being the location of the former Dachau Concentration Camp. Originally intended to hold political prisoners, it was here that eventually tens and thousands of persecuted people, including Jews, were killed by the Nazi regime. Established in 1933, Dachau was, in fact, the first of the many concentration camps eventually set up in Nazi-held territory. Today, there’s a memorial center and museum, as well as an art gallery. Getting to Dachau from Munich by public transport couldn’t be simpler; the S-Bahn train will whisk you there in around ten to twenty minutes. After that, you can walk into town from the train station, or take either bus 724 or 726 to the Concentration Camp Memorial Site. To gain an insight into the horrifying events of the Holocaust and World War II, many visitors to Munich opt to take a guided tour to Daschau Concentration Camp Memorial Site. This was the camp upon which all other Nazi camps were modeled. Excursions to the concentration camp are both moving and illuminating, and the commentary that the guides provide is eye-opening. See trip reviews & prices. The Linderhof Palace was the only castle out of three that Ludwig completed in his lifetime. His intended to spruce up the already existing lodge, but ended with a scaled down version of Versailles Palace. Of special interest are the Hall of Mirrors and the Peacock Bedroom. He lived in seclusion in this palace hideaway for much of his life. In honor of Wagner, Ludwig built a fantasy grotto partway up the mountain behind the palace based upon Wagner’s opera, Tannhäuser. Due to its relative proximity to Munich, Linderhof Palace is a very popular day trip amongst visitors to the city. With a car, it couldn’t be easier to get there. Heading south out of Munich, merely follow the Bundesautobahn 95 for around 45 minutes and turn off at Oberau. After this, you should see signs pointing you to Linderhof Palace. In total, it should take around an hour and ten minutes, and you won’t get bored as you pass some lovely scenery. A good idea is to combine your trip with a visit to the nearby Zugspitze – the highest mountain in the country. While it is relatively easy to drive to Linderhof Palace yourself, a lot of people decide to take a tour from Munich for all the extra features that it provides. Many tours combine a visit to Linderhof Palace with a stop at the beautiful Neuschwanstein castle that lies nearby. You can also enjoy a peaceful walk around the picturesque town of Oberammergau. See trip reviews & prices. 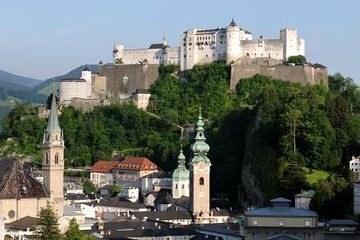 Located just across the border in Austria, Salzburg is probably best known as the birthplace of Wolfgang Amadeus Mozart. With its iconic historic center bursting with Baroque buildings, there are a lot of sights to soak up in Salzburg. Ride the funicular or hike to the top of Hohensalzburg Fortress, which dates back to 1077. The fortress is an icon of the city and offers picturesque views of the surrounding landscape. For those seeking to relive scenes from the movie “The Sound of Music”, must-see attractions include the 17th-century Baroque Mirabell Palace and Gardens and the von Trapp family home, which is now a hotel. By train, it takes between an hour and a half to two hours to reach Salzburg. On the way, you pass through some very scenic landscapes. From Salzburg’s central railway station, it is only a short walk to many of the city’s most impressive sites, so public transport is a quick and easy way to visit one of Austria’s most famous cities. To make the most of your time in the city, you may want to consider taking a guided tour. Guests are accompanied on the train ride from Munich to Salzburg and upon arrival are taken on an informative and entertaining tour of the city’s main attractions as well as the “Sound of Music” sites. See trip reviews & prices. Neuschwanstein, Ludwig’s fairy tale castle, is set on a hill above the village (and castle) of Hohenschwangau. It is one of the most visited castles in Europe. Walt Disney used it as a model for Sleeping Beauty’s Castle in Disneyland. Ludwig paid tribute to Wagner in this castle as well with the furnishings and by naming the castle after Wagner’s opera, the Swan Knight. The Singer’s Hall is the entire fourth floor where the walls display images that point to Wagner’s works. Slightly to the south of Neuschwanstein is another beautiful castle; Schloss Hohenschwangau. Maximillian II, father of Ludwig II, discovered Hohenschwangau Castle when he was still the Crown Prince. The vicinity in which he found it pleased him immensely. In spite of it being in ruins, he bought the castle and had it renovated. With two popular castles nearby, the town of Füssen is one of the most popular destinations for a day trip from Munich. 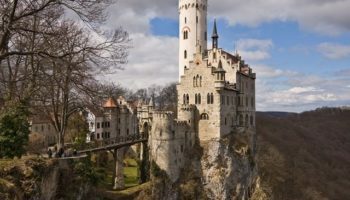 For visitors wanting to check out the fabulous Neuschwanstein Castle, there are a couple of important things to note before looking at travel options. First of all, visitors need to stop off at Hohenschwangau to buy their tickets to the castle at the Ticket Center. In the summer months, it is a good idea to book tickets in advance online as the place will be heaving with visitors and you may end up waiting a long time to buy tickets. In addition to this, the only way to enter the stunning castle is if you opt to go on a guided tour. As public transport works so effortlessly in Germany, many people opt to take the train. From Munich, simply take the train to Fussen railway station, which takes around two hours. From there, it is a short ten-minute bus journey to Hohenschwangau Neuschwanstein Castles, Schwangau – the nearest stop to the castle itself and the place where you need to buy your tickets. After that you can either take a short shuttle bus or Disney-esque horse-drawn carriage ride to the castle. By car, it takes slightly less time to get to Neuschwanstein from Munich. It is only an hour and forty-minute journey, but you may find that it takes you some time to find a parking space when you do arrive. From the city center, head south and take the Bundesautobahn 95 before turning off at Murnau am Staffelsee, where you then take the 23 until Steingaden. After that, it is an easy and short drive on Bundesautobahn 17 until you arrive at Hohenschwangau to buy your tickets. To avoid the hassle of getting there yourself, you can always opt to take a tour to Neuschwanstein and its surrounding sights. One popular option is to combine both Neuschwanstein and the nearby Linderhof into one package. As you are picked up in Munich, you can simply sit back and enjoy the fantastic castles at your leisure. See trip reviews & prices.